President Donald Trump has surrounded himself with federal government neophytes who have displayed their obvious lack of knowledge of how to run a country. But Trump’s most astute hire, National Security Advisor H.R. McMaster, is reportedly feeling the Presidential disdain for seemingly no other reason than he knows what he is talking about. 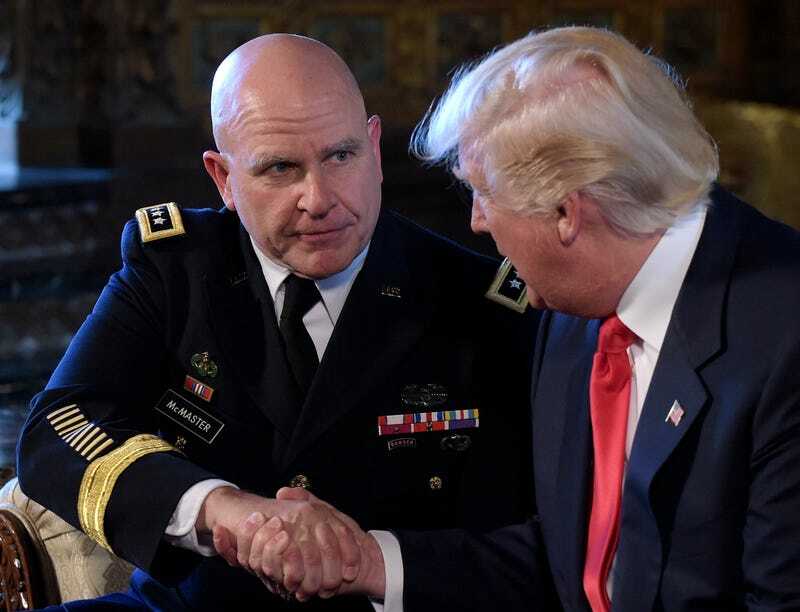 McMaster is hailed as a respected military mind, who made a name for himself as a young officer for criticizing the Joint Chiefs of Staff for their performance during the Vietnam War, and President George W. Bush’s invasion of Iraq, according to the New York Times. He commanded troops during the first Gulf War and received a Silver Star for commanding a tank during the Battle of 73 Easting, which is considered one of the most important tank battles since World War II. McMaster also has a PhD in history from North Carolina. Lt. General H.R. McMaster is an outstanding choice for national security advisor. I have had the honor of knowing him for many years, and he is a man of genuine intellect, character, and ability. He knows how to succeed. I give President Trump great credit for this decision, as well as his national security cabinet choices. I could not imagine a better, more capable national security team than the one we have right now. Now, Trump seems to not have the same glowing respect for the man he hired. Bloomberg columnist Eli Lake is reporting that Trump is unhappy with McMaster and that he has publicly feuded with the Army general over South Korea, whether to fire now-disgraced former National Security Advisor Michael Flynn and his selection of a deputy to hire at the NSA. Let’s go to the meatier part of Lake’s reporting concerning South Korea. Back in March, the U.S. deployed the THAAD missile defense system to South Korea to counter a nuclear missile strike threat by North Korea. Despite the limitations of the missile defense system, the deployment was seen as a move to assure Seoul that Washington is supporting defense of its nation. These officials say Trump screamed at McMaster on a phone call, accusing him of undercutting efforts to get South Korea to pay its fair share. Given Trump’s reckless shoot-from-the-hip approach to saying what comes to mind without appreciating how his words impact those around him, Seoul could have very well taken the insistence that had to pay for THAAD or risk losing support of the U.S. military. Why not? Trump said as much to NATO. McMaster, according to Lake, is widely respected by both sides of the aisle in Congress and credited with professionalizing the NSA. But Trump has been giving him less and less face time. For example, when Trump met with Australia’s prime minister, he didn’t take McMaster. Instead, the outgoing deputy national security adviser, K.T. McFarland, accompanied the president. Such a move clearly shows that Trump doesn’t respect McMaster, but it also reveals that he doesn’t care about policy; he only cares about loyalty—even if it is not in the best interest of national security. In another indication that Trump doesn’t care for McMaster, Trump, as late as last Monday, meet with former U.S. ambassador to the United Nations John Bolton to discuss “a range of issues with the National Security Council.” Trump wanted to hire Bolton as McMaster’s deputy, Lake noted, but the two decided that wouldn’t be the best idea for reasons that aren’t entirely clear, despite Bolton’s repeated insistence on bombing Iran. (Steve) Bannon and Trump, according to White House officials, pressed McMaster to fire a list of Obama holdovers at the National Security Council who were suspected of leaking to the press. The list of names was compiled by Derek Harvey, a former Defense Intelligence Agency colonel who was initially hired by Flynn. McMaster balked. He refused to fire anyone on the list and asserted that he had the authority to fire and hire National Security Council staff. He also argued that many of these appointees would be ending their rotation at the White House soon enough. By the way, even Obama reportedly told Trump not to hire Flynn. There is much to take from Lake’s column, but one thing is perfectly clear: Trump hates dissent—particularly from people who suggest that he may be wrong about certain issues. One of the most respected military minds in Washington may very well be on Trump’s pink slip list for nothing more than offering an informed opinion and not being an ideological extremist who makes decisions based on more than a knee-jerk analysis of a given issue. Of all of the people Trump should be most troubled with, he finds fault with McMaster, who has no known suspicious connections with Kremlin. It isn’t clear whether Trump’s dissatisfaction with McMaster will result in his firing. But what we should be concerned with is why Trump is so intolerant of the man who many credit with being the most respected military mind in the Oval Office.